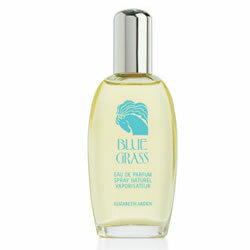 Elizabeth Arden Blue Grass perfume is a very feminine scent that possesses a blend of fresh cut flowers, wood and spices. Elizabeth Arden Blue Grass perfume has a rich but refreshing powdery texture and fresh aromatic tone, which makes this fragrance favourite a classic. Elizabeth Arden Blue Grass begins with Rose, Jasmine, Lily, Lavender, Geranium and Orange Blossom, over a heart of Vetiver, Clove and Laurel and a base of Virginia Cedar, Sandalwood and Musk.